One of the habits most of us struggle to break is the impulse to buy convenience snacks. Convenient snacks are everywhere we look (duh! That’s why they’re called convenient? ), and too often are the unhealthy kind. This post may contain affiliate links. See full disclosure policy here. It’s usually easier to reach for a sugary or extra salty snack to satisfy cravings or those late afternoon hunger pangs. And that is not always possible when you’re on a ketogenic diet since low carb snacks are not easily accessible as convenience food. Of course, the best way to tackle this little problem is to make the snacks at home ahead of time. Another genius idea is to stick to a simple meal plan that includes all three meals of the day including dessert. 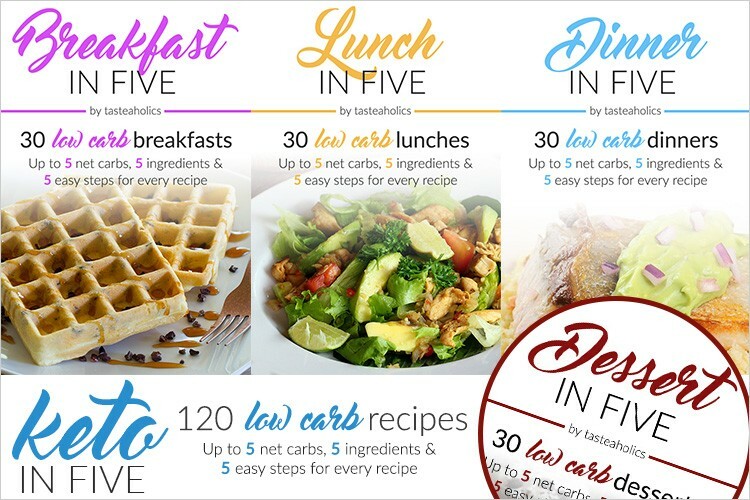 This meal plan is our favorite because you only need 5 ingredients to make each meal! But when that’s not do-able for whatever reason (because life), then it’s wise to have healthy snacks in your pantry, office or handbag. So we have sourced a few low carb snacks that can easily be packed or portioned out into your work lunch. They’re so simple, delicious and most of them taste like dessert, so hopefully, you’ll also satisfy your sweet tooth craving. Some great keto snack ideas include nuts and seeds, cheese, coconut chips, pork rinds, and quick ready-made shakes or drinks such as Perfect Keto and Bulletproof InstaMix. One of the easiest ways to keep you full on the go is to select from a range of keto friendly nuts and seeds. Think macadamia nuts, pecans, and brazil nuts as well as seeds such as flaxseeds, chia seeds, and hemp seeds. These nuts are high in fat, low carb and nutritious. The added salt is also helpful for keeping keto flu at bay especially when you first start on a ketogenic diet. Keep in mind that many packaged snacks including nuts and seeds contain other ingredients that may not be acceptable on a keto diet. Simply check the ingredient list if you’re buying in-store or even online. However, we have your back today since this list includes snacks that are perfect and specifically made for keto dieters. Here are the best keto nuts and seeds you can buy from Amazon and enjoy through the day. Pili nuts are nutritious snacks full of magnesium, essential amino acids, and healthy fats. And they have a rich buttery taste to boot. Basically, perfect for a keto diet. Top your keto friendly desserts with pili nuts or pack them to take to work. We recommend these flavored pili nuts. Flavors include coconut oil and Himalayan salt, rosemary and olive oil, and spicy chili. Most packaged trail mix snacks contain excessive sugar and cheap filler ingredients making them unsuitable for a ketogenic diet. The ELAN Low Carb Paleo Cereal Granola Shots is a grain free keto snack pack that contains only 2g sugar with 4g net carbs. It’s a combination of cashews, sunflower seeds, pumpkin seeds, brazil nuts to name a few. Free from processed and artificial filler ingredients, these are a low carb and healthy snack idea. Almonds are a great snack but it’s nice to enjoy seasoned almonds sometimes. Legendary Foods has a variety of deliciously seasoned almonds (our favorites are Buffalo Blue Wing and Cheddar Bacon ). These organic dry roasted pumpkin seeds are simple without the added unnatural flavors found in most packaged pepitas. Pork rinds are so delicious and if you get the right ones, they’re a totally guilt-free snack idea. And by right, we mean antibiotic and preservative free, and basically free of other nasty additives. The Epic Artisanal Pork Rinds come in various flavors like Pink Himalayan Salt, BBQ, and Chili Lime. Sugar-free, 100% organic cacao nibs are a satisfying snack to enjoy any time of the day. Made from 100% Wisconsin cheese, Just the Cheese Aged Cheddar, is a suitable snack to pack. Beef jerky is traditionally very high in carbs and sugar, so it can be difficult to find keto friendly beef sticks. On our search, we have found a high-quality beef jerky alternative (Mission Meat Grass-Fed Beef Sticks ) that’s non-GMO, grass-fed, and MSG and nitrite free. It’s basically tasty goodness in a bag, and so perfect for on the go snacking. Let’s face it, some store bought keto cookies are not very tasty, which kind of defeats the purpose. We’ve found Fat Snax to be one of the most popular keto cookies manufacturer and for good reason. Fat Snax has a good variety of cookies that actually closely resemble traditional cookies in taste. Pure 100% natural nut butter (with the exception of peanut which is a legume) such as almond butter is an excellent choice for a quick keto snack. It’s an easy way to up your fat and protein intake if you are struggling to meet those daily macros. Cashews are another great option since they’re high in magnesium helping you fight keto flu in the first week. This almond and pecan butter is a delicious low carb snack for those days when you want a tasty treat. One really good thing about the keto diet is that cheese is a guilt-free staple. So it helps to keep a stash of shelf-stable snacks such as Moon Cheese.